To order firewood please click here or if you would like to order by telephone please contact us on 01899 308412 or Becky on 07799713058. Our processor can also be hired with an operator for an hourly cost of £40/hr for cutting and splitting lengths on your own site. The processor can take up to a 15 inch diameter log and cut it to varying length and split 4 or 6 ways. This is a time efficient and cost effective way to process fallen timber on your own land to create your own stock pile of firewood. All our wood is sourced within Scotland and has been seasoned for at least one year (often longer). NEW IN 2016: we installed a Glenfarrow biomass boiler & log Kiln which means all our logs are kiln dried to ensure a consistent dry log product. Our processor can be altered to create varying log lengths to suit you/your stove/fires requirements. This set up gives a superior log quality due to reduced moisture content providing a more consistent product giving the customer full confidence in the product they have purchased. We deliver our wood in a tipping trailer which is a standard load holding approximately 2m3or the trailer can accommodate a double load of 4m3. 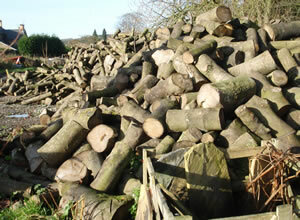 We typically provide a standard 10” log, however this length can be varied to suit your needs. Bulk loads can also be accommodated by tractor and trailer where there is suitable access. Kiddies Kindling (our childrens enterprise) sells Kindling at £3/bag. 1/2 Load - £15,	Full load - £30, Double load £60. Pine / Larch - a denser soft wood which burns longer and with less sparking than traditional softwood and is well suited to stoves/ranges. Hard wood - is slow burning and sparks very little and is excellent for open fires. All prices include delivery within a 20 mile radius of Quothquan. Delivery 20-30 miles from Quothquan is an additional £10, and 30-40 miles is an additional £20. Loads can be a mixture of the two types. Please be sure to take advice on the required fuel for your stove from the supplier of your wood fuel appliance. Areas covered for free delivery include: Carnwath, Lanark, Broughton, Abington, Dolphinton, Peebles & West Linton. Payment is due on delivery by cash, digital banking or cheque (made payable to Biggar Biomass).